Meanwhile, I’ve been working on a posting about Swiss steak, in which mirepoix often figures. Pounding meat, braising, mirepoix, and (for most people, though apparently not James Beard) tomatoes. A mirepoix is diced vegetables, cooked for a long time on a gentle heat without colour or browning, usually with butter or other fat or oil. It is not sautéed or otherwise hard cooked, the intention being to sweeten rather than caramelise… Where the flavour base is not pre-cooked the constituent vegetables may be cut to a larger size depending on the overall cooking time for the dish. Usually a mixture of onions, carrots, and celery (either common pascal celery or celeriac), the traditional ratio is two parts onions, one part carrots, and one part celery. 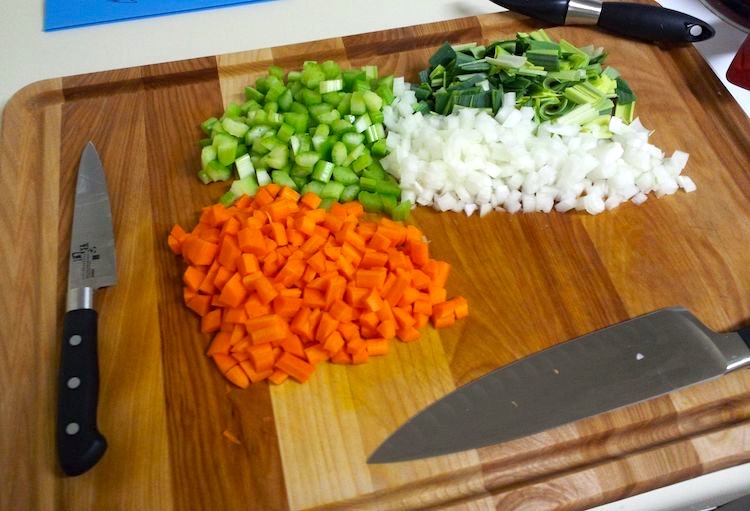 Mirepoix is the flavor base for a wide variety of Western dishes, such as stocks, soups, stews, and sauces. Similar flavor bases include the Italian soffritto, the Spanish sofrito, from Portuguese-speaking nations refogado (braised onions, garlic, and tomato), the German Suppengrün (leeks, carrots, and celeriac), the Polish włoszczyzna (leeks, carrots, celery root, and parsley root), the U.S. Cajun and Creole holy trinity (onions, celery, and bell peppers), and possibly the French duxelles (mushrooms and often onion or shallot and herbs, reduced to a paste). Though the cooking technique is probably older, the term “mirepoix” dates from the 18th century and derives, as do many other appellations in French cuisine, from the aristocratic employer of the cook credited with establishing and stabilizing it: in this case, Charles-Pierre-Gaston François de Lévis, duc de Lévis-Mirepoix (1699–1757), French field marshal and ambassador and a member of the noble family of Lévis, lords of Mirepoix in Languedoc since the 11th century. According to Pierre Larousse (quoted in the Oxford Companion to Food), the unfortunate Duke of Mirepoix was “an incompetent and mediocre individual…who owed his vast fortune to the affection Louis XV felt toward his wife and who had but one claim to fame: he gave his name to a sauce made of all kinds of meat and a variety of seasonings”. The term is not encountered regularly in French culinary texts until the 19th century, so it is difficult to know what a dish à la mirepoix was like in 18th-century France. … According to the 1938 Larousse Gastronomique, a mirepoix may be prepared “au gras” (with meat) or “au maigre” (“lean”). Mirepoix au maigre is sometimes called abrunoise (though strictly speaking this term more accurately merely designates the technique of cutting into small dices with a knife). A mirepoix au gras contains diced ham or pork belly as an additional ingredient. Similar combinations, both in and out of the French culinary repertoire, may include leeks, parsnips, garlic, tomatoes, shallots, mushrooms, bell peppers, chilies, and ginger, according to the requirements of the regional cuisine or the instructions of the particular chef or recipe. The analogous soffritto (frequently containing parsley) is the basis for many traditional dishes in classic Italian cuisine, and the sofrito serves a similar purpose in Spanish cuisines. In Cajun and Creole cuisine, a mirepoix or (jocularly so-called) “holy trinity” is a combination of onions, celery, and bell peppers. My 1961 English-language edition of Larousse Gastronomique notes that “Mirepoix is added to certain sauces, notably Espagnole sauce, to enhance the flavour. It can also be added to various types of braised or pot-roasted meat [like Swiss steak] or poultry.” Eventually, I’ll get to Swiss steak, a pleasant dish of American home cooking with very tenuous connections to Switzerland. This entry was posted on July 5, 2018 at 8:25 am and is filed under Language and food. You can follow any responses to this entry through the RSS 2.0 feed. You can leave a response, or trackback from your own site. Thank you for that new word. I am pleased to discover that I added a mirepoix to my mushroom barley soup last night.